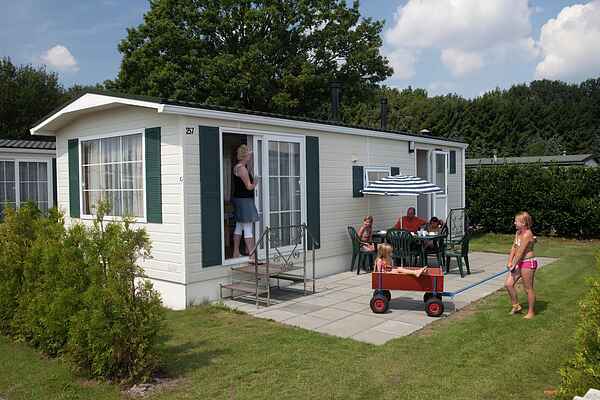 Holiday resort Duinhoeve offers a large variety of accommodations. There are several different types of chalets too. Choose between a standard 5-person chalet (NL-5071-02), a 5-person veranda chalet with two bedrooms (NL-5071-08), a 5-person veranda chalet with three bedrooms (NL-5071-09), a 6-person veranda chalet (NL-5071-10) and a 6-person Van Gogh chalet (NL-5071-11). The veranda chalets are of course different from the standard chalets because of their comfortable veranda. The most special type is the Van Gogh chalet. This is completely furnished in Van Gogh style, providing it with a very special atmosphere. All chalets are equipped with garden furniture and you can park your car next to your accommodation.